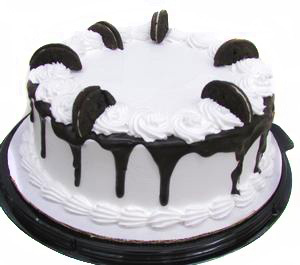 For hospitals and other locations, we provide our delicious ice cream cakes for your guests to purchase. Ice cream cakes are a great way to celebrate, whether it's to thank your staff for a job well done or to help the new parents celebrate their arrival of their baby. Our cakes can currently be found in the St. Elizabeth Hospital cafeteria. Roc-Star ice cream cakes come in three sizes. Our 6-inch cake serves between 4 and 5 people. Our 8-inch cake can serve 6 to 9 people. Our 9-inch cake serves 10 to 12 people. All serving sizes are suggested. Each cake features rich vanilla and chocolate ice cream with a cookie crunch layer in the middle. The cakes are frosted with whipped cream and can be beautifully decorated to order. Cakes are also available to order by contacting Roc-Star.